Toy Trains of Darjeeling Himalayan Railway (DHR) run along narrow gauge track passing through some of the most scenic mountain routes in the world. It has been recognized as a UNESCO World Heritage Site since December 1999. The journey offers breathtaking views of the mountains, valleys, forests, tea gardens and local villages on the way. Known as one of the engineering marvels, the toy train track has several zigzags and loops on the way that help the train to negotiate steep gradients. And there are a number of small stations along the way. Ghoom is the highest point on the route at an altitude of 7,404 ft. This is the highest railway station in Asia and second highest in the world. As the train has to ascend to such a height in about 80kms distance, there are sharp gradients, bends & curves on the way. The sharpest curve has a radius of 69 feet. Mark Twain once came to Darjeeling in 1896. After his trip by the DHR Toy Train, he remarked "It is the most enjoyable day I have spent on earth." 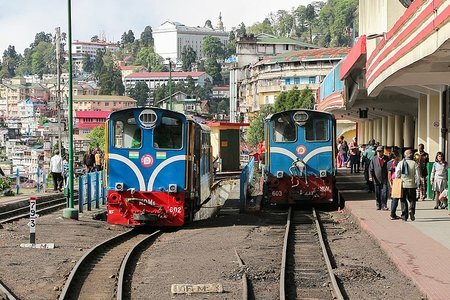 The toy train for Darjeeling starts at the New Jalpaiguri Railway Station (NJP) and goes all the way to Darjeeling travelling a distance of 88kms. There are of course short joy rides and other short distance connections. In most part the railway track runs parallel with the Hill Cart Road and at many points even crisscrosses it. For the NJP to Darjeeling route, the earlier steam engine has been now replaced with diesel engine which is more powerful and faster. 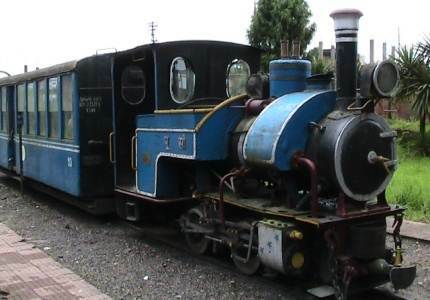 The steam engine hauled toy train took more than 10 hours to reach Darjeeling from NJP. The diesel loco hauled train takes about 7 hours 15 minutes. Check out Toy Train Rides & Services for all the services of DHR including the joyrides. This is a major railway junction in the region and the starting point for the toy train. This station was opened in 1964. Many long distance trains pass through it. NJP connects the Siliguri area to various points in the country. 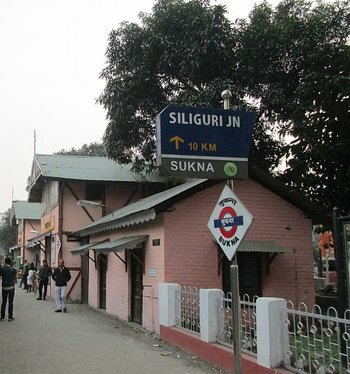 It was originally known as New Siliguri Station and later renamed since it was located in the Jalpaiguri district. Recently there have been large number of food stalls that have come up outside the station area. This is where many passengers who come by long distance trains complete their breakfast or meals before heading off to the mountains. This is the oldest station on the route that was opened in August 1880 during the British colonial days. 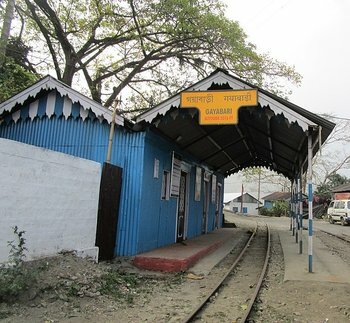 In the earlier days this station used to be the terminal station for the trains coming from Kolkata and was also the starting point of the Toy Train. This is where the famous personalities like poet Rabindranath Tagore and National leaders like Netaji Subhash Chandra Bose and C.R. Das had alighted to make their onward journey to Darjeeling. This station was opened in 1949. It once used to be the departure station for all trains leaving for the north eastern states of India. 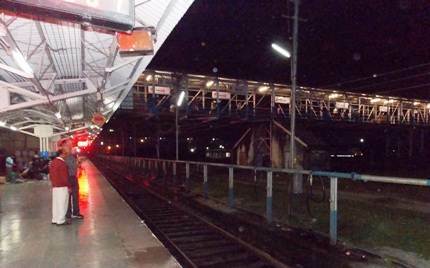 It is the only station in India which has tracks of all three gauges, i.e., broad gauge, meter gauge and narrow gauge. The main Siliguri bus stand known as Tenzing Norgay Central Bus Terminus is located next to this station. Sukna is a small village. The station here was opened in August 1880. 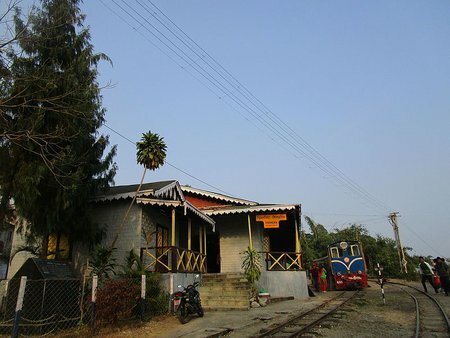 There is a Darjeeling Himalayan Railway Museum at Sukna showcasing rare sketches and pictures that depict the history of the heritage toy train. Visit DHR Sukna Museum to know about the museum and its offerings. From Sukna area, there is a gate to enter the Mahanadi Wildlife Sanctuary which is well known for elephant migration and even Royal Bengal Tigers and Himalayan Black Bears. It is from Sukna the real ascend starts and soon you will realize how the gradient increases rapidly. Through pines and bamboo forest, the landscape starts changing quickly and the magnificent views begin. Immediately after Sukna, you will experience the first sharp curve and then a loop on the track. From Sukna the train has to climb for more than 890 feet in just 7kms to reach the next station Rangtong. Towards the end of this stretch there is a steep gradient. As a result of which a sharp spiral loop was created through a deep cutting. However during the 1883 rains, the rocks slipped and filled up the cutting and therefore the track had to be realigned. It was re-done by lowering the gradient and today the track on this stretch runs at a level lower than the main road. Rangtong station was opened in August 1880. From here the train has to ascend by more than 1400 feet in just 12kms stretch to reach the next station Tindharia. Soon the line turns towards South into a long spur. In order to negotiate a steep rise of 137 feet in a short distance, there is a spiral or a double loop created here. The second loop is an engineering marvel and is one of the most complicated ones with a sharp curve in the loop. After the spiral, the line heads back towards the northern direction offering lovely view of the mountains and valleys. You can see the Bhutan range on the east. Below and on the south east, you can see the river Teesta flowing. The river originates from the Tibetan lake Chalamu located at an altitude of about 17,000 feet. You can also see the Tiger Island on its course. It is so named because three tigers were once shot here. Along the way you will encounter a zigzag (i.e. a reverse) on the track which is created to gain a steep height. This is another engineering feat. A spiral or a loop was not possible here. Tindharia is a small village and the name stands for 'three ridges'. The locals are mostly Nepalese. This station was also opened in August 1880. In 1910, a Darjeeling Himalayan Railway workshop has been setup here for overhauling the toy train engines and repairing the coaches. The stretch between Tindharia and the next station Gayabari is probably the steepest. Shortly after the Tindharia, there is a zigzag and then comes the final and the most sensational loop known as The Agony Point. As the name suggests, this is one of the most breathtaking loops in the entire DHR track. Earlier the loop was so short and the curvature so sharp, at one point on top of the loop the train used to literally overhang the deep gorge below. Later, improvements were made and the curve was somewhat eased out. In the picture, you can see the return path having gained height from its entry point below. After Agony Point and before reaching Gayabari, there is another zigzag. This another small village and the station is on the roadside. The station has retained its original structure since its construction. From Gayabari towards the next destination Mahanadi, you will pass by the last zigzag on the route. There is a story that in the deep gorges below, one of the construction workers killed a Himalayan black bear. He shot the bear by using a gun and copper coins as bullets. After the last zigzag and up to the next station Mahanadi, the gradient eases out a little. On the way the train usually stops near a mountain stream known as Pagla Jhora (Mad Torrent) to refill water. This is supposed to be the half way point to Darjeeling. Although this is a small stream, during the monsoon it often swells up and sometimes washing away the roads and tracks. The station was rebuilt in 1989. There is a waterfalls nearby with 150ft drop which is the source of Mahanadi river. It is this river that the train crosses early in its journey and shortly after leaving Siliguri station. From the Mahanadi station, the train moves towards Kurseong. The gradient in this stretch is little easier. Before reaching Kurseong, you will pass through a steep rocky mountain known as Giddapahar or Eagle's Craig. From here you get excellent view of the valleys and the tea gardens. 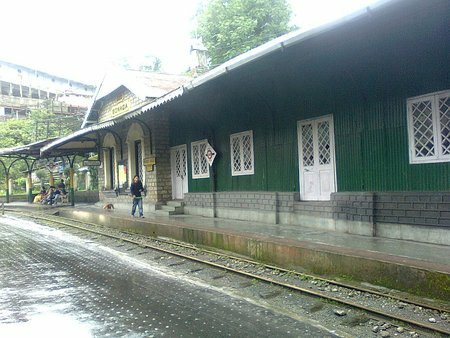 Kurseong station was opened in August 1880. The name Kurseong signifies 'The place of the white Orchids' because lots of small white orchids blossom in this area during the spring time. It's now become a popular hill town. 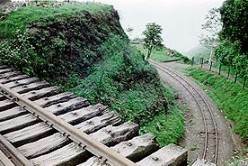 The toy train track runs along the right side of the Hill Cart Road as it goes through the Kurseong area. 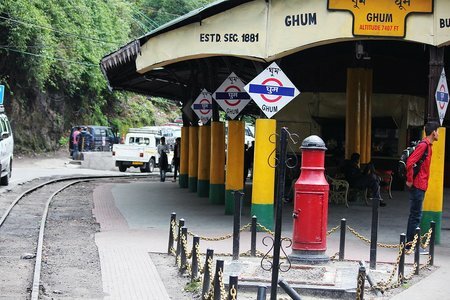 Although the main market area through which the toy train passes is quite congested, there are lovely scenic areas and tea gardens in Kurseong. Makaibari Tea Estate is only 2kms from the town center. 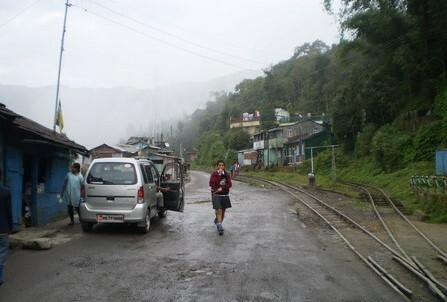 Kurseong is also famous for many well known schools several of which came up during the British colonial days. 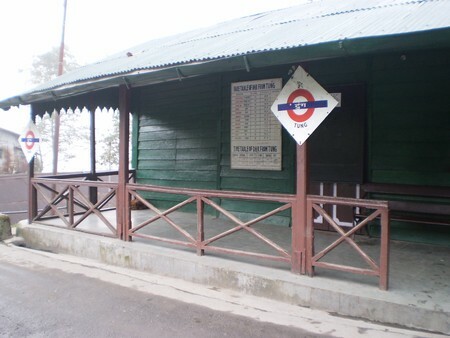 The DHR museum at the Kurseong station has well preserved artifacts about the toy train and its story. Within couple of minutes from Kurseong station you will see the West Bengal Government run Kurseong Tourist Lodge on the left. Five minutes from here you will pass by the famous Gothals Memorial School. From Kurseong the train passes through forests full with maple, cardamom trees, chestnut etc. After a while you will reach a small sleepy village known as Sipahidhora. Here the track crosses over the Hill Cart Road (NH55) and runs on the left side and below the road level. You can see many village cottages and two storied buildings made of wood and tinned roofs. Tung is a small sleepy village. The station here was opened in April 1881. The name of Tung has originated from Tun trees that are found in plenty here. 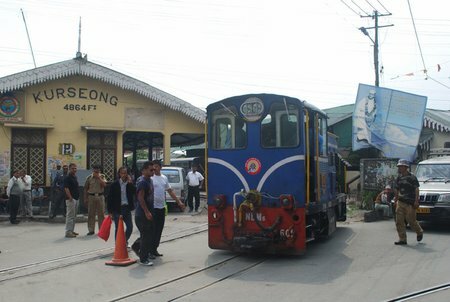 As you approach the outskirts of Tung, the rail track crosses the road to the right side. From Tung, the gradient of the track increases up to the next station Sonada. You can get a wonderful view of the Kurseong hills from here. On the left you will see the Margaret Hope Tea Gardens of Goodricke, which is laid on a steep hill slope that runs into a deep valley and offering a breathtaking view. There are a few village schools in Tung and you will be often greeted by the school children on the way. The Hill Cart Road and the rail track pass through a small village called Dilaram and then Gorabari before entering Sonada. Sonada station was opened in February 1881. Locals say that lots of Himalayan bears used to come to this area. Sonada is also well known for the Salesian College. You will see this college when you are approaching Sonada township from Gorabari village. Sonada is a congested town and a small trade center. You will pass by the Sonada market area before reaching the train station. There are numerous small shops on the road side including clothing stores, shoe stores, food stalls and even small cyber cafes. Ma Bhawani Fast Food seems to be a popular snack outlet here serving sweets, samosas, kachuris etc. As you leave the market area, you can see the Sonada Monastery on the right. Sonada township stretches to more than a kilometer on the road. From Sonada up to the next station Ghoom, the gradient is the easiest. The train passes through the Senchal Forest & Sanctuary which is full with varieties of plantations like rhododendrons, chestnuts, oaks, magnolias and lot more. During the spring time, the rhododendrons blossom all over offering a spectacular sight. Before reaching Ghoom, the road and the rail track pass through a small town called Jorebungalow. Here you will see a road that leads to Kalimpong. It takes about 2.5 hours to reach Kalimpong via Teesta Bazaar. From Teesta Bazaar one can also go to Gangtok. 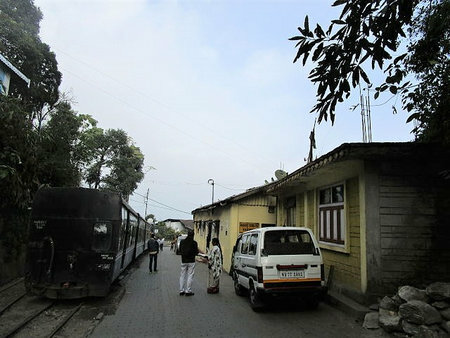 This is the highest point in the Darjeeling Himalayan Railway and is the highest railway station in the whole of Asia. As you approach the Ghoom station, you will notice the road that comes all the way from Mirik. The DHR Ghoom Museum is located at the station premises. Check out the link Ghoom to know about Ghoom area and the nearby attractions. The last station is Darjeeling. On the way the train passes through Batasia Loop, another engineering feat where the train takes a spiral loop to negotiate a steep descent of about 140ft. From the garden of the Batasia, the view of Kanchenjungha snow peaks and Darjeeling town landscape is just a treat to watch. From here up to Darjeeling you will continue to enjoy the vista of the mountains. On the way you will see Dali Monastery perched on the cliff and right next to the road. And then you will pass by a colorful building and a well known art center, Ava Art Gallery. This is the terminal station and was opened on 4th July 1881. The original Darjeeling station was destroyed by the devastating earthquake of 1934. It was later rebuilt around 1944 in an Art Deco style. Although many modifications have been done in recent times, you can still find a hint of the Art Deco design. 1) Check out DHR Toy Train Story to know about the complete story of the toy train including its history and how it was introduced as one of the highest mountain railways by the British. 2) Visit How to reach Darjeeling for complete information on reaching Darjeeling from various places in India and neighboring countries.